The Decumanus Maximus, the central one, used to be located where today we find Via dei Tribunali, flanked by the Decumanus Superior (Via dell’Anticaglia) and the Decumanus Inferior, known as Spaccanapoli. Survived the passage of time.Originally, the road linked the area of ​​Piazza San Domenico Maggiore with that of via Duomo. The expansion of the city in the Roman period led to the enlargement of the road which included also the area of Piazza del Gesù Nuovo. From the year one thousand onwards, beautiful churches were built on both sides of Spaccanapoli, as well as several buildings of some of the most powerful families in Naples. During the 16 th century, the viceroy Don Pedro de Toledo lengthened the decumano to the neighborhoods built to house his army, known as the Quartieri Spagnoli: a maze of narrow alleys (vicoli), built so as to form a chessboard to allow immediate descent of the army to Piazza del Plebiscito in case of need. The heyday of Spaccanapoli occurred during the Renaissance, when in addition to the restoration of churches and palaces new buildings were erected on the ruins of those destroyed. In fact, Spaccanapoli is not a road but a path that contains in its inside the arteries that spread under different names. For its characteristic divisions, to all, Neapolitans and foreigners, this set of roads has become Spaccanapoli, a journey through time, offering tourists, a taste of traditional Naples of ancient times, surrounded by a frenzied developing of modernity. Around SpaccanapoliWalking through Spaccanapoli is like passing through a thousand years of history in a few kilometers, advancing towards the future, driven by the city's past. Spaccanapoli: A walk through the centuries. 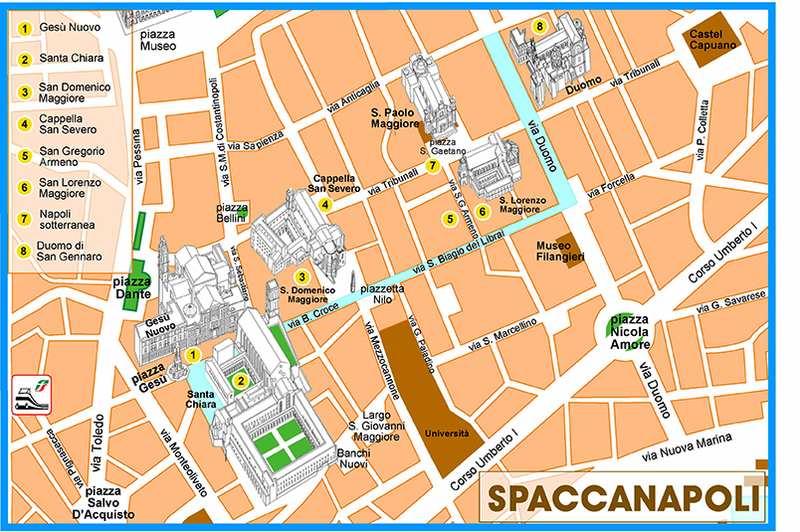 Along Spaccanapoli is possible to see and visit many churches and buildings. In addition to the impressive Monastery of Santa Chiara, which is located near the Piazza del Gesù Nuovo, along Spaccanapoli, in the direction of the district Forcella, there is the Church of San Francesco delle Monache. It was built by Roberto d’Angiò to house the nuns of Santa Chiara. The Church hosted the noblewoman Giulia Gonzaga, one of the most fervent supporters of the reform of the Church. Its structure had been completely redone in full eighteenth-century style, eliminating the original medieval design. Since the entrance is situated in a very narrow road, a perspective technique has been used to realise the opening so that the gate does not prevent to see the door. The pillars in piperno stone that hold the gate are inclined slightly towards the interior in order to facilitate the sight of the entrance even with the gate closed. Over the years though, it has been abandoned with no maintenance and thieves have been able to plunder it and reduce it to the deprived state that we can see today. Churches, palaces and ancient voicesSpaccanapoli, in reality does not exist as a road. It is the result of different paths that collectively converge in one direction. It is the echo of an ancient history, the memory of a Naples that shows itself only occasionally, between modernity and tradition.Carried by incessant chatter, Spaccanapoli hosts a number of beautiful palaces, which have seen the growth of generations of nobility. One of these is Palazzo Flaminio, in which in 1946 Benedetto Croce dedicated a room to lodge the Italian Institute for Historical Studies, which he founded. You can end your walk in Piazzetta Nilo, which has had its name for over two thousand years, since the Alexandrians founded their settlement here. At the center of the square, there is the statue of the God Nile which has remained in the same spot, since its installation, apart from a few years of the 1400s when it mysteriously disappeared to then reappear, just as mysteriously, in 1476. Spaccanapoli leads to one of the most beautiful and compelling places in Naples: San Gregorio Armeno, where there is the traditional market of the shepherds.